The hamster wheel that will power the Samsung Galaxy S III has been shrouded in mystery so far, but thanks to a Samsung exec who shall not be named, now we know that it will be a quad-core 32nm Exynos processor. That makes Exynos 4412 ever more certain to debut in there, since it is indeed made by the frugal, yet more powerful 32nm process, and has four cores that can be humming at 1.5GHz-1.8GHz maximum speeds, depending on who your source is. It is still a Cortex-A9 design, but the die shrink and larger number of cores make for a brawnier and efficient replacement of the current 45nm Exynos in the Galaxy S II. 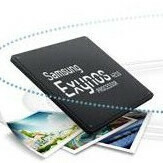 The decision to go with a one-chip solution for the Galaxy S III has been strategic and came directly from the boss JK Shin. What sounded like music to our ears was the reiterated 26% performance improvement in the new Exynos, with 50% gains in battery life. If you want to see the power consumption and performance of the 32nm Exynos vs the current-gen 45nm, check the demo Samsung did for us at CES. The S4 uses 28nm, which has around the same, if not better, power consumption improvement. It can be clocked from 1-1.7 gHz, and a quad-core variant clocked at 2.5 gHz is slated to be released later this year. I wouldn't count out the S4 if I were you. Exactly, that is what I am always preaching. The new Qualcomm dual-core S4 Krait Pro is coming out this summer & out of the box with 28nm, & 1.5GHz that can be overclocked to 1.8GHz with the new Adreno 320 that will have true Xbox 360/PS3 graphics. Also this fall like you said the Qualcomm S4 Krait quad-core with 28nm, 2.5GHz & Adreno 320 will truly be a marvel. The efficiency it will have due to its 28nm technology will be a huge advantage for Qualcomm, & that is why you can't count them out. The S4 line is a very complete & competent line. It will be right up there with the rest that's for sure. you are comparing apples to oranges. the 26% power improvement is from dualcore 4210 to dualcore 4212. thats just from the die shrinking. That is NOT for the quadcore. The article is not worded well in that regard. The S4 gets a 50% gain from the S3, not from the Exynos. That puts it a hair above the exynos 4210 in performance. However, even a 26% improvement from the 4210 to the 4212 puts that back ahead of the S4 in performance and battery... without doing anything other than a die shrink. When you go quad core 4212 and get the extra performance and battery benefits, its going to leave the S4 way behind. At the same time of the Quad S4 launch is just about the same expected window for the Quad 5xxx exynos based on A15 with its massive upgraded GPU. I'll bet whatever you want that exynos A15 crushes the S4 A15 wannabe at the same clock speeds. Well I hope so because this article is implying that the quad-core 32nm Exynos A9 compared to the dual-core 45nm Exynos A9 is only a 26% difference in performance. I hope that it was a wording error as you are claiming because if not that is going to be a disappointment to me. Ohh & what's the bet? Could it be he just be referring to the jump in clock speed without referring to the additional cores i.e. .3/1.2 = 25%. Yes that is with the older Adreno 225. The new Adreno 320 will definitely affect those quadrant scores. Remember the Adreno 320 will be on par with the Xbox360/PS3 in graphics output. That will sh*t on the Adreno 225 that comes with the original S4. You know the S4 "Pro" is the real monster dual-core from Qualcomm, that is the one with the Adreno 320. That one will be out this summer, right after the first or original S4 with Adreno 225 that you are basing your numbers on. Ohh good point, the S3 is greatly affected by the resource hog that is HTC Sense! A S3 with vanilla Android will score huge numbers on Quadrant. The Sony Xperia S's skin is not a resource hog like HTC’s Sense. Nice ngo2dd! Yes u are absolutely right. It's scoe is 4,876 if we are talking nos. Open your eyes @remixfa, S4 will be on par with exynos 5250 (this is the series 5 samsung which u keep on referring wrongly in your posts by the way). I think the hope is that we get to see the 5-series chipset in a phone this year, but for right now it is slated to be a tablet processor according to Samsung. The 5-series will be a beast when it is released. However, I think we are getting too caught up on these processor benchmarks when we should just recognize that each of these chipsets coming out this year are powerful in their own right. I mean in all honesty, for what we use our phones for now, you are not going to really notice the true processing power of each of these chipsets. This is very comparable to the PC world where people go out and buy the latest six-core or eight-core processor and GPU, but the games that are out now may only use at most 4-cores (think of games like BF3). So, I think you won't truly see the benefit of quad-core chipsets for another year or so, which by that time you will most likely be looking at the Exynos 6-series or S5 chipset both perhaps based on a six-core chipset. And on a side note, you can spew out benchmarks showing Exynos is better or S4 is better and they both wouldn't mean anything. Just like in the PC world, the chip manufacturers can put in kernels and drivers that take advantage of a certain benchmark. What is going to really matter is real world performance and I don't think you would be able to find that much of a difference unless Samsung makes certain games aimed at their chipset and Qualcomm makes certain games aimed at their chipset. WAIT! did you guys leave the HUAWEIII K3V2? that looks like a good competitor! just reminding it, dnt leave it out of the equation of dual cores :D! The Qualcomm S4 dual-core Krait with Adreno 320 is scheduled to be released this summer as the S4 "Pro". Then we will see what the Adreno 320 will do. It's head over heels more powerful than the Adreno 225. They claim Xbox360/PS3 power out of the Adreno 320, that is crazy! Also that is not too far away! You need to do 10x times (minimum) compared to Adreno 225 to achieve levels of PS3/XBOX. Even though these consoles are very old, I find it hard to believe that a generational jump would mean so much improvement in performance, specially keeping battery life into perspective. Well the Adreno 225 is pretty similar to the SGX543MP2. And the Adreno 320 is suppose to be 4 times the performance of the 225. Now, the SGX543MP4+ as you know is the chipset found in the PS Vita which produces PS3-like graphics. So I am pretty sure the Adreno 320 will be comparable to that chipset. It's too early to tell though, but it would be my guess. I really want the Exynos 5-series quad-core with the Mali t-658 GPU. The Mali t-658 is going to have 10 times the performance of the Mali 400 found in the SGS2. Just to put this into perspective we can look at the Open GL benchmarks. The Open GL Egypt 720p benchmark for the Mali 400 found on the SGSII is 50.5 fps while the same benchmark for the new iPad is 140.9 fps. Imagine 10 times the performance of the Mali 400. It would absolutely kill the GPU found in the new iPad especially when coupled with an A15 quad-core processor. Yes I have to agree with you, that Mali t-658 GPU is going to be very beastly, but that is not scheduled for this year. The earliest it might appear will be late Q1 or early Q2 of 2013. The Adreno 320 will be out this year on the S4 Pro this summer & on the quad-core S4 late Q3. This is what Qualcomm claims. I tend to believe them because everything they have claimed before has actually come true, especially since they are not the only kid on the block anymore. Qualcomm says it will be true Xbox360/PS3 graphics that can be produced with the Adreno 320. Remember the Xbox360 came out in 2005 & the PS3 came out in 2006. That is 6+ year old technology. It's definitely plausible that the Adreno 320 CAN actually deliver on those claims. 32nm with HKMG. HKMG very good. Ok the 50% gains in battery life is VERY impressive. The 26% performance gain from a dual-core to a quad-core is not that impressive. Plus the integration of LTE on their SoC is huge, so no fake Galaxy S III's in the U.S. anymore. I think the 32nm dual-core A15 Exynos will be better performance gain than the mere 26% from the quad-core 32nm Exynos 4412. I don't know if I am too impressed with the 26% gain in performance. Though the 50% gain in battery life indeed is an eye opener & a game changer! If we're talking 26% performance increase over what my Nexus has.. I'm all for it! Couple that with 50% better battery life.. kind of sounds too good to be true! I would very very gladly take a smaller boost in performance and BIG gains in battery life. We also don't know which GPU the phone will use.. so it could very well have significant performance gains in games. I'm most excited about the possibility of better battery life.. bring it! 26% increased performance is mainly because of the clock-speed bump. 1.5/1.2 roughly equals to 125%... The GPU though could be about 2x time more powerful. This is for dual core 4212 SoC: http://www.samsung.com/global/business/semiconductor/minisite/Exynos/data/exynos4_dual_32nm.pdf I am sure 4412 will have atleast same or more powerful GPU. Check this for dual core 4212: http://www.samsung.com/global/business/semiconductor/minisite/Exynos/data/exynos4_dual_32nm.pdf Quad core 4412 should be better than this.